I hate to write this, but the evidence is clear: many people make really bad decisions about their relationships. We get blinded by hormones and a pretty face (or body) and fail to look deeper. We choose security (in its many forms) and give up our own power. Or we put off having the ‘tough’ conversations and find out, late, that they person we’ve just spent years with is fundamentally incompatible. 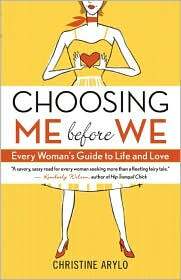 Choosing Me Before We is written by a woman, for women, but I’m happy to say that its as valuable for men. The writing is conversational without being ‘hip’ and is devastatingly straightforward. Like all self-help books there are exercises and questionnaires throughout; unlike most, these will get right into what you are thinking, feeling, and manifesting in all of your relationships. One caveat: the author is heterosexual, and her preference leaks through. It’s not overwhelmingly male-female, however, and I feel that the evaluations and training are valuable for any woman, no matter her sexual or partnership preference. That comes from the fact that Choosing Me Before We focuses on empowering the reader to understand herself better. In doing so, she will make better choices in her relationships. One of the best parts of this book is the chapter on change. It’s all about changing ourselves – we can’t change anyone else; not at all. Realizing the truth of that can be a profound life-alteration.